French fries continue to gain popularity within the fast food industry. Restaurants have produced their own shapes and sizes of french fries ranging from wedge cut, shoe string, waffle fries, and curly fries to compete over the customers’ attention and taste buds. Because of the increase in consumption of french fries over the years, the production of french fries have also increased including the need for further raw materials. The farming, manufacturing, transportation, and distribution process of these materials reveals that their byproducts such as chemicals and toxic waste, leads to pollution and other harmful effects to the environment. Fast food chains usually use frozen french fries that are delivered from factories, which are then refried in local restaurants. By doing so, they are able to easily manipulate the efficiency and appearance of their french fries when they are served to the public. However, in order to understand the full concept of materials that are used in the life cycle of french fries, one must uncover the materials that are used during the farming process first. Potatoes are the main ingredient used in french fries. Russet potatoes are more common to be grown for french fry production because of its ability to be sliced into longer pieces of french fries due to its oval shape (How It’s Made Frozen French Fries). Moreover, russet potatoes provide a crunchier texture when they are fries as well as a whiter color that lasts a longer time compared to other potatoes (How It’s Made Frozen French Fries). To make sure that the potatoes produced are the best quality, other materials such as the amount of water, soil, and fertilizer are important factors to keep in mind. Furthermore, farmers also tend to use pesticides to ensure that pests would not damage the potatoes that would make them unsatisfactory to be sold to the public market. Although pesticides allows farmers to have a peace of mind from the threat of pests, pesticides tend to contaminate soil and especially bodies of water. According to the National Center for Biotechnology, “More than 90 percent of water and fish samples from all streams contained one, or more often, several pesticides” (Aktar, Sengupta, & Chowdhury, 2009). As the demand for more potatoes increased for the production of french fries, farmers increased the need for pesticides for plant growth, hence also increasing the effects of environmental pollution. After the farming process, the potatoes are transported to the factories where they undergo through the manufacturing process. Potatoes are passed through different sets of machines to prepare the potatoes into washed, peeled, and cut pieces of french fries. The main material that are used in these machines are steel, however for the purpose of narrowing the context of materials used in the manufacturing process, it can be argued that expanding more about other materials and parts of these machines are unnecessary. On the other hand, another important ingredient for french fries included in the manufacturing process is vegetable oil. French fries are commonly fried with vegetable oil, which is made out of “Canola Oil, Corn Oil, Soybean Oil, Hydrogenated Soybean Oil, Natural Beef Flavor [Wheat and Milk Derivatives] (French Fries (Medium) Compostable Packaging). High usage of vegetable oil can also lead to negative environmental effects when disposed improperly. Such negative effects includes being able to “Cause devastating physical effects, such as coating animals and plants with oil and suffocating them by oxygen depletion” (The Surprising Negative Impacts of Vegetable Oils and Animal Fats). Since vegetable oil is one of the main ingredients that allows fast food chains to maintain the desired flavor and texture of their heavily demanded french fries, it is concerning how much vegetable oil are being disposed incorrectly. Hence, vegetable oil can be considered as a threat to environmental pollution. The last step of the manufacturing process of french fries are portioning the french fries into packaged plastic bags. Plastic bags are used in this process since they are inexpensive and abundantly supplied. Plastic bags also ease the process of transporting the french fries to multiple fast food chains. But since most plastic bags are non biodegradable, plastics usually end up in landfills where they would last for hundreds of years when turned into waste. According to the Environmental Health News, “Plastic buried deep in landfills can leach harmful chemicals that spread into groundwater” (Fischer, 2009). This explains that the constant use of plastic bags and containers for french fries partake in the increase of environmental pollution as well as making bodies of water hazardous for living creatures. Once the potatoes have been prepared and packaged into french fries, the bulk of french fries are transported to various restaurant locations. The main mode of transportation used for this process would be through roads, where large trucks are used since they are able to carry items at a higher capacity compared to other vehicles. In order for trucks to exert energy, trucks need large amounts of gasoline for the weight of their cargo as well as the distance of their travels. Gasoline is made from “the refinement of petroleum, or crude oil” (Gasoline). Moreover, gasoline was “originally discarded as a byproduct of kerosene production, but its ability to vaporize at low temperatures made it a useful fuel for many machines” (Gasoline). The discovery of gasoline can be considered as a material that follows the different steps of the general pattern for the chemical innovation. New synthetic materials, such as gasoline, were invented due to the use of large quantities of raw materials over time. However, these synthetic materials are usually toxic to the environment. Based on a study by the U.S. Energy Information Administration, “The vapors given off when gasoline evaporates and the substances produced when gasoline is burned (carbon monoxide, nitrogen oxides, particular matter, and unburned hydrocarbons) contribute to air pollution (Gasoline and the Environment). The production of french fries relies on transportation vehicles and gasoline, but the increase in french fries also means that the use of gasoline has also increased. This describes that the burning of gasoline in vehicles contributes to the increasing risks of environmental pollution. The next step after the french fries are delivered to designated restaurant locations is to distribute the product to the consumers. The french fries are fried again in vegetable oil to make sure that their product would be hot and ready to serve. Once the french fries reach the right temperature, the workers would then season with the proper amount of salt for taste. Salt is a natural mineral that composed of Sodium Chloride (NaCl) (Andrei, 2015). Even though salt is a natural material, a constant intake of a high sodium diet is not a healthy choice for individuals. It had been found that a high sodium consumption can “stiffen blood vessels, leading to high blood pressure, heart attack, and stroke” (Health Risks and Disease Related to Salt and Sodium). It is important to keep in mind the amount of sodium that is consumed when eating french fries from fast food restaurant in order to set a limit and balance the body’s daily nutritional needs. Lastly, once the french fries are seasoned, the fries are transferred into small packages to hand out to the public. French fry containers are used for the convenience of serving sizes and to have the right appearance that reflects the restaurant’s product. The common material used for french fry holders is cardboard paper because of its durability to hold the right portion size of french fries. On the other hand, the continued used of paper products have been proven to partake in further environmental issues. Paper can be a useful product, but it it also a “big contributor to the problem of deforestation and is partly to blame for the endangerment of some species that live in the forests” (Environmental Impact of Paper Production). Moreover, paper is a renewable material, but it will take a couple hundred of years for trees to grow and repeat the paper making process. The increasing demand for french fry products lead to further production of paper as containers to be passed to consumers. This cycle becomes a one of the leading causes for environmental pollution. Throughout the years, individuals become more reliant on fast food companies for the speed and convenience of their food products. French fries became a popular item due to its’ consistent flavor and affordability. The rise for the demand of french fries leads to an increase in the need for more materials to provide during the farming, manufacturing, transportation, and distribution process. These products and byproducts also increased the potential harmful effects to the environment, which include air, water, land, and chemical pollution. The life cycle of french fries is a give and take relationship between the satisfaction of customers due to high demand, and environmental consequences caused through the constant production of french fries in order to meet high demands. “Gasoline.” How Products Are Made, www.madehow.com/Volume-2/Gasoline.html. TRR56. “How It’s Made Frozen French Fries.” Youtube, 6 Oct. 2010, youtu.be/SyK02WTJ4W8. French fries are one of the most widely consumed items in the fast food industry globally. 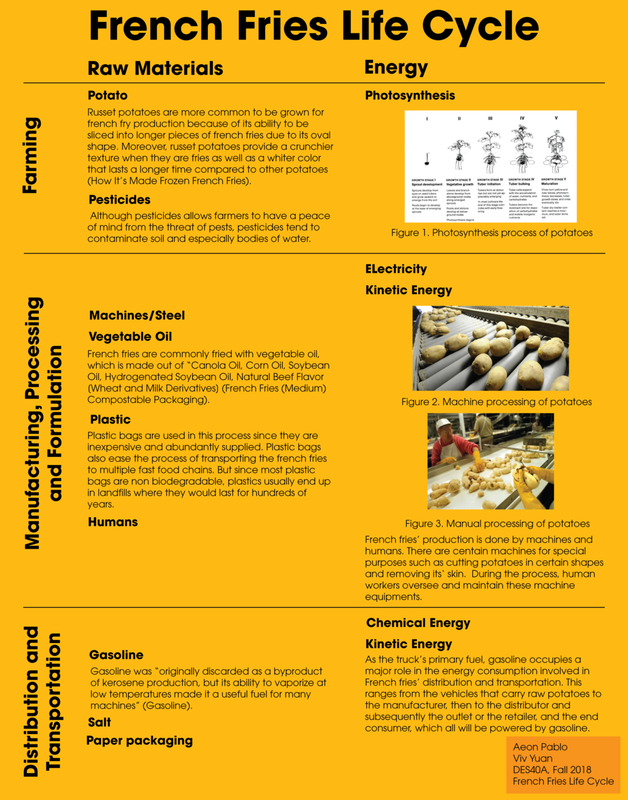 French fries’ primary raw material is potato, while oil is the secondary raw material. The key production processes for French fries include the growth of the primary and secondary raw materials and the frying process of potato. The energy consumption of French Fries consists of four stages, which include the growing process of potato and oil, manufacturing, distribution and transportation in industries. Although both the growth of raw materials and transportation of French fries between industries are energy consumptive, the manufacturing phase is considered the most energy-intensive stage due to the large consumer demand for French fries in the fast food industry. The amount of energy put into the growing and harvesting process of French fries' primary raw material is considered the slightest. The only process that costs energy in the growth of potato is photosynthesis. There are five stages of potato growth, which are sprout development, vegetative growth, tuber initiation, tuber bulking and maturation. (Bradley, 2009) Making use of the moisture of soil, the potato starts growing by the effect of photosynthesis. By the time of maturation, the tuber growth rate slows, vines die, and the photosynthesis process gradually decreases. (Bradley, 2009) Similar to the growth of other plants, potato growth does not consume additional chemical energy after harvesting. Moreover, potatoes can be used as an ultimate low-cost energy source that can produce electricity. Nguyen explains that a potato can provide energy for electronics in a deficient way at approximately “one-tenth the cost of a typical AA battery” without connecting to a “power grid”. (2013) In this case, potatoes can be regarded as a gift from nature which brings much more benefits to a human being’s life than disadvantages. As a plant product, potato serves as a fundamental energy source and only consume little energy in nature. In relation to the embodied energy consumption in potato growth, the energy needed by French fries’ secondary raw material, oil, is estimated to be at a low rate. In most of the restaurants, the ingredients in oil are usually a chemical combination of different forms of plant oil. The most common frying oil used for making French fries in fast food industries is corn oil. (Warner, 2010) In general, corn oil is inexpensive compared to other vegetable oils such as olive oil and canola oil. Similar to French fries’ primary material, potato; the major chemical energy required in producing oilseeds is photosynthesis. Consequently, corn oil’s energy consumption is approximately equivalent to the potato’s energy consumption. Nevertheless, the energy outputs in potatoes and corn oil are quite disparate. For instance, the calories in oil contain a lot more energy than the calories in potato due to the density of nutrients in the oil. Hence, the calories in French fries will exponentially increase after frying potatoes with oil. In addition, as a medium for cooking, a small quantity of oil can produce a large number of French fries. This brings out the mystery about the life cycle of French fries’ used oil. Restaurants usually store the oil and have to eventually get rid of it when it is no longer fresh. To avoid environmental pollution and reduce waste, the ‘Association for Restaurant Owners for a Sustainable Earth’ also called ‘AROSE’, purchases used cooking oil from local restaurants so that they can convert the oil into "biofuel" which is subsequently used for “heat and power generation.” (Meindersma, 2012) AROSE’s eco-friendly movement not only achieves the goal of saving raw materials and preserving the environment but also provide local residents with a sustainable community. Therefore, French fries’ secondary raw material, oil, can be reused and recycled from its output. Thus, the life cycle of oil is not determined as a high energy consumptive process in French fries’ production. Manufacturing French fries is the most essential energy consumptive stage of producing French fries. Manufacturing French fries involves processes such as cutting potatoes in certain shapes, sorting and cleaning the potatoes, frying the raw materials with secondary materials, and maintaining the equipment. The whole process relates to both the energy consumption caused by animate and inanimate power. Figure 2: to produce French fries, most of the processes are done through large automated machines in industries. (Poulton, 2016) Hence, potatoes are often processed through specialized machines for the task. For example, in the beginning, one machine’s role is to separate bigger potatoes from the smaller ones. Then, another “clothes dryer” like machine is used for removing potato skins. Finally, a machine is operated for preserving frozen French fries. (Poulton, 2016) The major fuels that are used to power those machines are kinetic energy and electricity. Calculating the total energy usage by multiplying the number of machines and the energy required per unit in one factory, the total energy needed for manufacturing French fries in all places would be imponderable. Furthermore, besides the processes that are performed by machines, figure 3: the human worker’s job in the factory is to maintain the equipment which consumes kinetic energy also. (Poulton, 2016) Even though the energy input and output by humans do not seem as enormous as those by machines, the works that are performed by humans are still quantifiable. In this case, the embodied energy consumption is incredibly high due to the large demand worldwide for French fries among fast food industries. Distributing and transporting French fries from the manufacturers to local stores is the final stage of French fries’ production, which is also energy intensive but less than the energy consumed during the manufacturing phase. A food distributor for one of the biggest fast food industries McDonald’s, Matin-Brower, states that they were transporting “all of McDonald’s products via truck.” (Brenner, 2015) Thus, trucks are considered as the main energy consumers when it comes to the distribution and transportation of French fries. Also, local residents are part of the stakeholders, and their energy consumption for French fries in restaurants is the fuel used for vehicles. The U.S. Energy Information Administration claims that “gasoline” is the most common transportation fuel that used in “cars, motorcycles, trucks and boats.” (EIA Gov., 2018) As the truck’s primary fuel, gasoline occupies a major role in the energy consumption involved in French fries’ distribution and transportation. According to How Products Are Made, gasoline was “originally discarded as a byproduct of kerosene production, but its ability to vaporize at low temperatures made it a useful fuel for many machines.” (Advameg, 2018) Hence, gasoline is eligible to be counted as a reused product which means it is less expensive than the cost of electricity. Since any vehicles carrying raw potatoes to the manufacturer, then to the distributor and subsequently the outlet or the retailer, and the end consumer will all be mainly powered by gasoline. Among the different stages of the French fries’ lifecycle, there is significant energy consumption involved from the time when potatoes as primary raw material and oil as the secondary raw material is harvested, to all the processing and transportation required. Studies have demonstrated that consuming a kilogram of potatoes processed as French fries, produced nearly five times greater environmental impact than consuming a kilogram of fresh potatoes, due to the high energy consumption and losses involved in the product energy life cycle. (Mouron, 2016) Comparing each of the processes involved, it is evident that the manufacturing, processing and formulation stage is the most energy intensive during French fries’ production. The manufacturing stage is considerably more energy intensive than the transportation phase, as well as the harvesting phase, because of the greater extent of human labor involved and the energy consumed by different processes such as washing, sorting, cutting, impurity removal, rinsing and storing. (McCAIN, 2018) Each of these days requires energy obtained from electricity. In contrast, transportation of the fries from the manufacturer to the wholesaler, retailer, and the private consumer requires gasoline as the main energy resource. Despite electricity being cheaper form of energy than gasoline, the extent of large-scale processing and manufacturing involved requires a considerably large amount of energy input in the manufacturing stage than the transportation stage. To conclude, a number of processes are involved in French fries production starting from harvesting potatoes from farms, to the production of oil from different resources such as corns, and its formulation and transportation. However, the manufacturing and formulation process is the most energy-intensive phase in the French fries life cycle that adds to the high environmental impact of consuming French fries as compared to fresh potatoes. Information on energy consumption within each phase of the product's life cycle is essential to calculate the overall impact of its energy consumption and helps account for losses and inefficiencies within the system. Moreover, the global tends to increase food shortages and involves in non-sustainable practices, it is critical to evaluate but necessary to improve the entire supply chain of highly consumed foods such as French fries in order to minimize wastes, improve sustainability and reduce its environmental impacts. Bradley, Adam. Potato (Solanum tuberosum). 2009. 2 December 2018. How French Fries Are Made. McCain Foodservice Advantage Australia. McCAIN, 2018. Web. Effects of Food Loss Reduction, Loss Treatments, and Process Modifications." Nguyen, Tuan C. A Potato Battery Can Light Up a Room For Over a Month. 2 December 2013. 2 December 2018. <https://www.smithsonianmag.com/innovation/a-potato-battery-can- light-up-a-room-for-over-a-month-180948260/>. November 2016. 2 December 2018. <https://blog.qad.com/2016/11/manufacturing-food- know-fries-made/>.